This work formed my PhD thesis at Curtin University in 2013-17. It focused on the behavioural and acoustical responses of coastal dolphins to noisy environments, focusing on bottlenose dolphins (Tursiops aduncus) in the Swan River, Perth and bottlenose and snubfin dolphins (Orcaella heinsohni) in Roebuck Bay, the Kimberleys. As human activities continue to expand across the marine environment, anthropogenic noise in the ocean is also rapidly increasing. The most wide-spread source of noise pollution is from motorised vessels, which have the cumulative effect of reducing habitat quality by increasing underwater noise levels. This is of particular concern to dolphins due to their elaborate and extreme specialisations for auditory comprehension and sound production underwater. Coastal dolphin species are especially vulnerable to noise pollution, due to their high degree of habitat overlap with human activities. My PhD set out to describe the soundscape of coastal dolphin habitats and examine how prominent anthropogenic noise sources may impact these animals. To do this, I used a combination of visual and acoustic monitoring techniques. Autonomous underwater acoustic recorders collected data on dolphin acoustic habitats within the Swan River and Roebuck Bay. 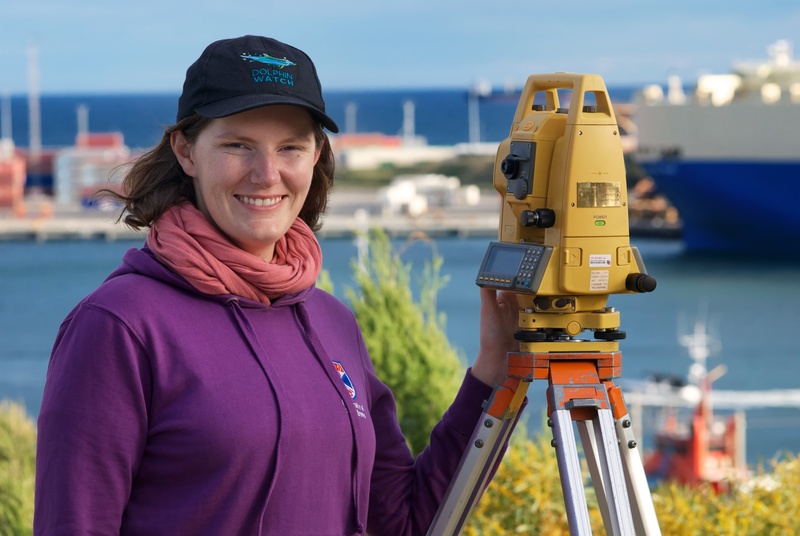 Land-based theodolite tracking at two sites within the Swan River provided information on vessel traffic whilst also recording dolphin occurrence, movement speeds, and behaviour. Acoustic datasets collected at six Swan River sites indicated that some sites were ‘noisier’ than others, with the Fremantle Inner Harbour being noisiest from an anthropogenic perspective. The most wide-spread man-made sound in the river was vessel traffic. Theodolite observations showed differential site use by the resident bottlenose dolphin community. Animals occupied the Fremantle Inner Harbour more frequently and for longer periods than Perth Waters, despite the heavier vessel traffic at the former site. However, when investigated at a finer scale, I found that dolphins altered their movement speeds and activity states at high vessel densities in the Fremantle Inner Harbour. Dolphins also varied characteristics of their communication whistles when levels of underwater noise changed at this site. Finally, I compared the noisy environment of the Fremantle Inner Harbour with the relatively pristine acoustic habitat of Roebuck Bay and considered the potential consequences of increasing noise in the latter. Overall, this thesis categorises new soundscape recordings from the Western Australian coastline, quantifies the contribution of human activities to these soundscapes, identifies the response of coastal dolphins to anthropogenic activities and noise, and discusses the potential consequences should ‘quiet’ dolphin habitats be altered. This work suggests that dolphins remain present at key foraging sites within the Swan River, despite the presence of human stressors. It may be the short-term energy gains from foraging outweigh the energy costs of disturbance. However, the potential consequences of long-term stress from disturbance has yet to be determined. Considering the small size of the Swan River dolphin community, this information is important for managers of the river system. Additionally, more sensitive, inexperiences populations – such as dolphins in Roebuck Bay – may respond differently to the habituated dolphins of the Swan River. How these dolphins deal with noisy environments is important for conservation efforts.